Mushroom Adventures began in 1996 in a San Francisco basement garage. The founder, Donald Simoni, had been growing mushrooms for over five years, when he needed more equipment: a pressure cooker that cost over $400.00. This seemed like a lot of money at the time to spend on a hobby, so Don made a few mushroom kits to sell at the local mushroom fair. Mushroom Kit sales went very well and Don earned half the money for the pressure cooker. Shortly after the San Francisco mushroom fair another mushroom fair in Santa Cruz was coming up so Don attended it and sold more mushroom kits. So began the business, Mushroom Adventures. Each year Don continuously made improvements on the instructions and the manufacturing of the mushroom kits until he felt they were perfect. By talking with the customers over the sales table, Don received a good feel for what people wanted and expected out of his products. He then set out to deliver the best product he could. By 1998, we had the first mushroom kit boxes printed. 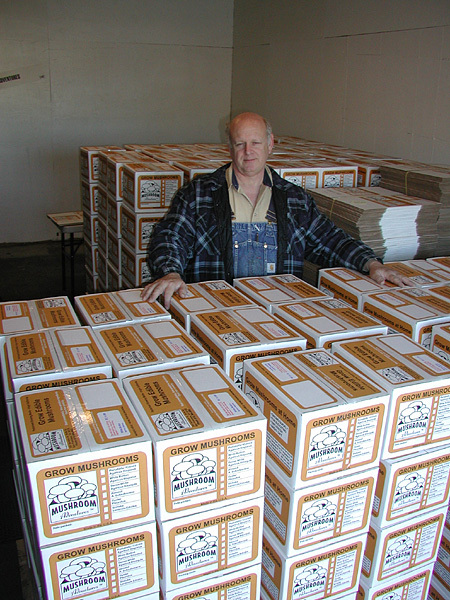 In 1999, we began wholesaling our first mushroom kits. This went well and by the year 2000, we had acquired our second wholesale account. In 2000, we out grew our basement operation and moved the production portion of our operation to Petaluma, Ca. There we had more room and we were closer to our raw materials. Being in Petaluma afforded us more space so we acquired Emus for mascots. They are the second largest bird in the world. They weigh 130 pounds each. We hatched them in a small incubator. We started with 3 birds, but now we have 4. They have been an enjoyable pleasure and distraction from work when we need it. We still sell kits at fairs and special events, including wholesale, retail and mail order sales. Our product line has increased by adding new mushroom kits and removing some that proved difficult to maintain. We have been going through growing pains as the company sales have increased which has continuously forced us to find better ways to handle higher volume and to make a better product. We have future plans of acquiring our own property and relocating our entire operation on our own land. This would give us the ability to build our facility to suite our needs. This may be several years down the road, but it is an objective to strive for. Check out our Photo Gallery of Mushroom Adventures pictures. We have included pictures in the gallery of our operation, Mascots and most of all the people that have contributed to our success. Our business is seasonal and therefore most of our help are seasonal as well, but many of them have been contributing seasonal for many years now. In 2005 Mushroom Adventures obtained our own land up in the Marysville area of the central valley, just north of Sacramento. Here we began the expansion faze of our company. The new property had a house but no out buildings for us to do our work. We purchased and had built a 6,000 square foot general agricultural building. Since mushrooms are sensitive to temperature we insulated this building to handle the extreme temperature fluctuations that occur in the central valley. From this new building we continued to manufacture our mushroom growing kits. In 2008 we applied to the CCOF for an organic certification for our fresh mushroom production. To accomplish this we had to make our own compost. This required us to pour more concrete and increase our wharf working space to have the room to make the compost. After some trial and error we began to produce excellent organic compost. We grow our fresh organic mushrooms for the farmers markets from this compost. Our mushroom kits are made from the same compost, but are not certified organic. In 2010 we also began thinking of growing a regular supply of fresh mushrooms to sell at the farmers market. To make this happen we built a second building divided into 3 growing rooms. The growing rooms were insulated with 4 inch thick insulated urethane panels. We drew on our knowledge from visiting other mushroom farms and designed the building ourselves. By 2011 we had our air conditioners installed and were grow crimini, white button and portabella in them. Our crops were rotated to always have mushrooms to take to the farmers market. In 2013 we began to grow increased quantities of shiitake and oyster mushrooms. This worked out well because it allowed use to add oyster and shiitake mushroom kits to our selection of mushroom growing kit. In 2014 we have begun small upgrades in our equipment to make things easier for us with the increase in production. In 2015 we have started the season off soundly and are looking forward to a successful year. In 2016 it was a very wet year. We had 180% of our normal rain fall. This unusual amount of rain made it difficult to maintain the correct level of moisture in our compost. We also experimented with the production of our Shiitake, Lion's mane and Hen of the woods (Maitake) blocks. In 2017 we decided to purchase 2 - 12" x 21" x 30" carports to keep our compost out of the rain during the last 2 weeks of aging. This was a great success. Our compost is much more productive as a results. Most of the mushroom kits were made as ordered and as a results the kits were fresher and grew better. We also added a red label to each of the mushroom kits telling the grower the product is time and temperature sensitive and to start the mushroom kit in a timely manor. This help kept the customer growing there mushrooms and producing plenty of mushrooms. In 2018 it has turned out to be a reawakening of mushroom adventures. I added a general video of mushroom adventures to our website. I have also modified our compost and substrate formulas for all our mushroom kit. As a results the mushrooms are growing much better and yields in the mushroom kits are too. This was brought about by composting the compost a little dryer and increasing the formula. Also with better control of the pasteurization process there has been an increased in production. I also modified the shiitake and oyster mushroom kit formulas to boost mushroom yields significantly. In some cases different strains of mushrooms are being used to enhance growth and yields. Our customer are going to like our mushroom kits and enjoy them as never before.. In 2019 we begin the year with great optimism. We are going to streamline our fresh mushroom production and focus on growing mushroom varieties that are reliable to produce.